To Sum It Up: Amani dreams of a life far away from her home in Dustwalk and hopes that her sharpshooting skills will help her obtain the money she needs to escape. Her plans get set into motion with some unexpected assistance from a mysterious stranger named Jin, with whom Amani finds herself fleeing across the desert from the authorities. The pair must not only evade their pursuers but also the dangerous otherworldly beings that dwell in the sands. While Amani doesn’t entirely trust her new companion, she also isn’t sure she wants to strike out on her own, either. 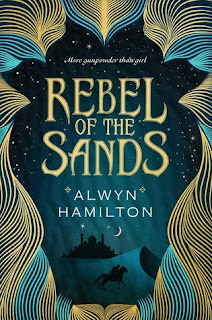 Review: This is one of those instances where I’m going to need to talk through what did and didn’t work for me about a book because I’m really torn over what to rate Rebel of the Sands. Overall it’s a solid debut novel, but there were also a few key things that I thought could have used some fine tuning, like the pacing. One rating seems like it gives too much weight to these items, while another feels like it doesn’t take them into consideration enough. So let’s see if we can sort this out. Rebel of the Sands can best be described as a Western set in the Middle East. Our heroine, Amani, is a feisty gunslinger who’s banking on her sharpshooting prowess to get her the hell out of dead end Dustwalk. Although it took a while for me to buy into the world, I give Alwyn Hamilton a lot of credit for coming up with an intriguing mash-up that also tosses supernatural elements into the mix. In this world, beings such as djinni, ghouls, and skinwalkers are not just myths. Again, I did think that it took some time for the separate components of the world to cohere. By the end of the novel, everything had meshed together nicely, but I can’t help wondering what the effect would have been if this had happened earlier on. My primary issue with this book boils down to the difference in pacing between the first half of Rebel of the Sands and the second. When we first meet Amani, her sole focus is on putting as much distance as possible between her and Dustwalk. Once she leaves the town behind, though, the plot wanders for a while until the “rebel” part of the title fully moves to the forefront of the story. Yet even as I found myself asking what was next for Amani beyond Dustwalk and waiting for something big to happen, I didn’t lose my investment in the book because the prose is engaging throughout. The plot definitely picks up again when Amani and her traveling companion, Jin, meet up with a set of lively characters and the fantasy aspects are much more tightly integrated into the story. I’m still not entirely sure how I feel about the development of the romance in the book. While there’s undeniably chemistry between the two characters involved, the relationship proceeds to the romance stage a bit fast. But then I love a good slow burn, so perhaps my bias is showing here. 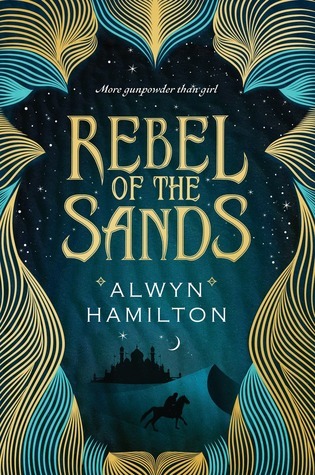 Although I thought the first half of Rebel of the Sands felt a little light on plot, at no point did I want to put the book aside because the writing kept me turning the pages. I really enjoyed the second part of the novel, when the world and the fantasy clicked into place for me. If the series carries this momentum forward, it’s going to be a good one. All in All: This is worth a read if you’re looking for a fresh spin on fantasy, though you may need to be a bit patient with it waiting for the world to gel and the pacing to gain its footing. But the second half of the book really soars and demonstrates the series’s strong potential. I was also glad that it wasn't the latter half of the book that moved at a slower pace. It's so disappointing when a book starts off with a bang then loses its steam. The strong finish definitely left a positive impression! I've been hearing so much buzz about this book - it's good to know that the beginning is a little slow, but it ramps up. I love the mash-up for genres, and how that makes this story unique, so I definitely hope to read it soon! I'm curious to see what you think of it! The world is such an interesting combination of elements; I hadn't read anything quite like it before! I like the sound of this one. I'm glad for the warning that the beginning is not as good as the last half, so I'll know to read it when I'm feeling alright for a slower read at first. It sounds like I'll enjoy it a lot more when the paranormal aspects are more at the forefront. Great review! The supernatural beings in this one were really interesting, and once they started playing a much bigger role, the book really got going!